The full text of my speech. The vigil started at 3.30pm in Trafalgar Square London outside the Burundian Embassy. I thought I’d tell you, from a purely personal point of view, a little about what it has been like over the last fifteen years since my daughter was killed. The grief doesn’t get any easier to bear. There isn’t a day goes by that I do not mourn my beautiful, clever and above all loving daughter, Dr Charlotte Wilson. Charlotte’s life was all about love whether, researching cockasackie virus, helping people with the St John’s Brigade or teaching Science in Rwanda.Had she lived she would have helped to draw up the Science curriculum for secondary schools in Rwanda. It was love for her Burundian fiance, Richard that led her to take that bus in order to meet his family.They too share our grief. 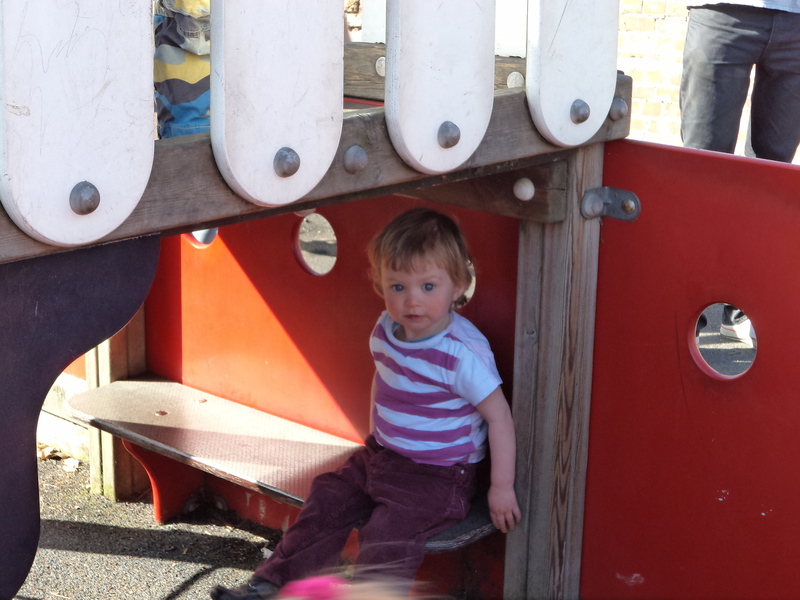 A new generation is growing up without ever knowing their Aunty Charlotte or their other Uncle Richard. and the anger doesn’t get any less .Anger because still, after fifteen years no one has been put on trial for an attack on innocent civilians in a bus. It wasn’t long before a group was named as responsible for the attack on the Titanic Express. 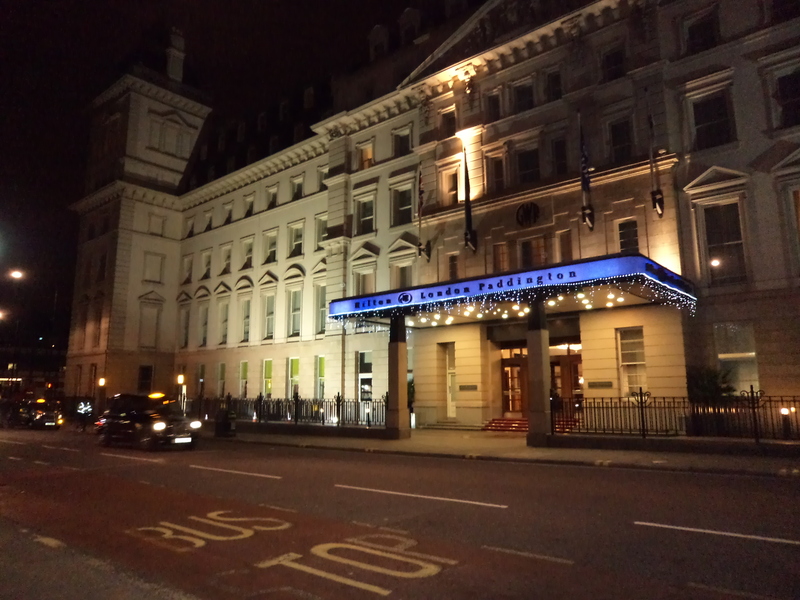 Eventually , through the good offices of a courageous employee of the Foreign and Commonwealth Office, we had sight of a document written by one Albert Simona describing in detail the loot that had been taken from the ill-fated passengers : mobile phones, clothes and cash among other things. Not only has no-one been brought before a court but the perpetrators of this crime have continued their slaughter. We remember also today the many victims of the massacre at Gatumba in 2004 for which the FNL. with others, claimed responsibility. I should like to pay tribute to the families and friends of the victims of that attack for their campaigning work. We hope one day to see this case of Gatumba taken to the International Criminal Court of Justice., which has been set up since Charlotte was killed. we can’t arrest Mr Agathon Rwasa, leader of the FNL, because we don’t know where he is. Shortly afterwards a photo of Mr Rwasa appeared in a national newspaper. 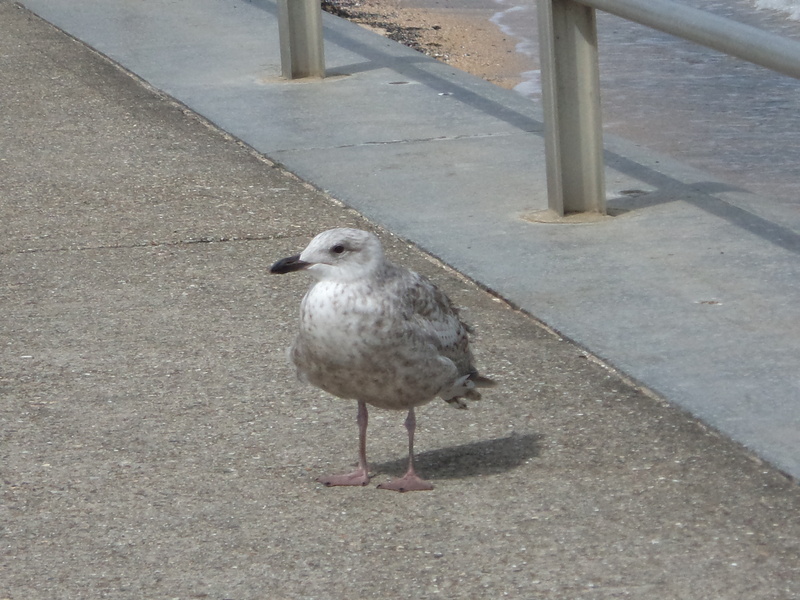 He was wearing a suit and was about to sign a peace deal. A peace deal which proved worthless. This year he stood for election to the Presidency of Burundi. The family has visited our Foreign and Commonwealth Office many times. The former MP for Edmonton, Andy Love, who was our MP when Charlotte was killed, accompanied us almost always and gave invaluable support. Each time we were introduced to an impressive array of FCO officials and assured that Charlotte’s case was raised with the Burundian authorities at every opportunity. I’m sure it was. Nothing has yet come of these representations and successive Burundian governments seem unwilling or unable to inform us of any progress in the case. Following one of these meetings a couple of years ago I telephoned the Burundian Embassy. They seemed quite keen to promote trade in Burundi but completely at a loss when I asked what progress had been made with pursuing those who had committed the attack on the Titanic Express. So I wrote them a letter, which received no response. So. I wrote another letter, in French this time and again there was no response. This seems to me a bizarre reaction. What kind of government cannot explain what it is doing to prosecute criminals or to at least offer condolences to a family who has suffered an atrocity on its territory? He has joined forces with a campaigning group of people from Burundi and from the Congo who are now in the UK. Together they have formed www.allianceforjustice.net and organised this vigil. Today we come here not only to ask for justice for the victims of the Titanic Express massacre but to ask that the ongoing killings in Burundi come to a stop. Secondly, following the genocide in Rwanda, where the international community stood by and did nothing to stop mass killing, people have felt that this must not happen again. The theory of a responsibility to protect was developed. This means that it is possible to send in a peace -keeping force without waiting for the agreement of the government in power. It looks as though the African Union is prepared to do just that. Whenever girls are educated, whenever murderers are stopped in their tracks, we light a candle in the darkness. Pour ceux qui sont nouvellement arrivés en Angleterre: Soyez les Bienvenus. Racontez vos histoires. Utilisez nos moyens démocrates pour poursuivre la justice et ensemble nous y arriverons. Butteremere, amidst the unique fells of the Lake District, was the venue of the last mile. 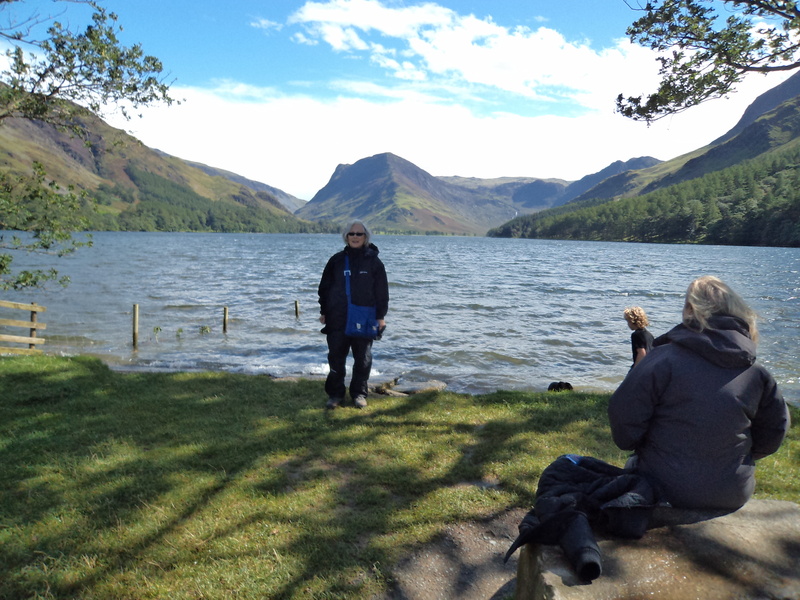 Having been beset by hail on the Honister Pass, the rain cleared after lunch and we indulged in stone skimming along the surface of the lake. Here then, as requested by one trustee some time ago, is a picture with me in it. The becks raged down the fell into the lake, swollen by torrential rain earlier in the week. There we are, one fifth of the distance to Rwanda, covered since I started in July 2008. Hardly an athletic achievement but one which has led me to get to know London, the Thames and Kent in particular. The occasional forays to Paris and the North have been ones to savour. I’ve learnt to enjoy the pleasure of walking at one’s own pace, alone, as well as the familiar one of walking in company. I’m grateful to all those readers who have commented and, occasionally, put me right on facts. As for Rwanda, there continues to be splendid work done by the projects that the Charlotte Wilson Memorial Fund has supported. I wish that country a peaceful and democratic future. We rarely support projects in Burundi because of the difficulties of overseeing them in a country so beset by conflict and turmoil. Until we can be confident that an attack like that on the Titanic bus can be punished and the perpetrators brought to book, there can be no peace. 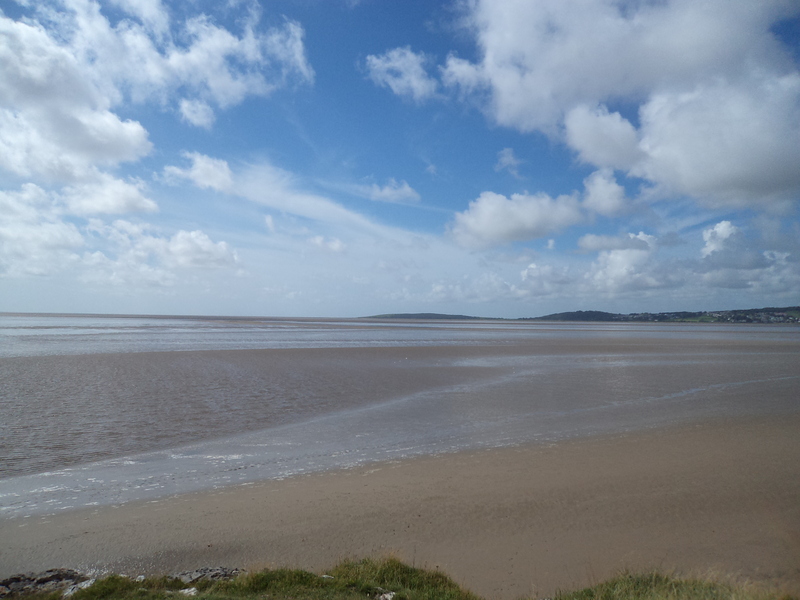 Starting from Arnside , we headed towards Far Arnside along the edge of the treacherous sinking sands of Morecambe bay. After the concrete path the going was not easy on slippery rocks until we reached a road and crossed up into woodland. 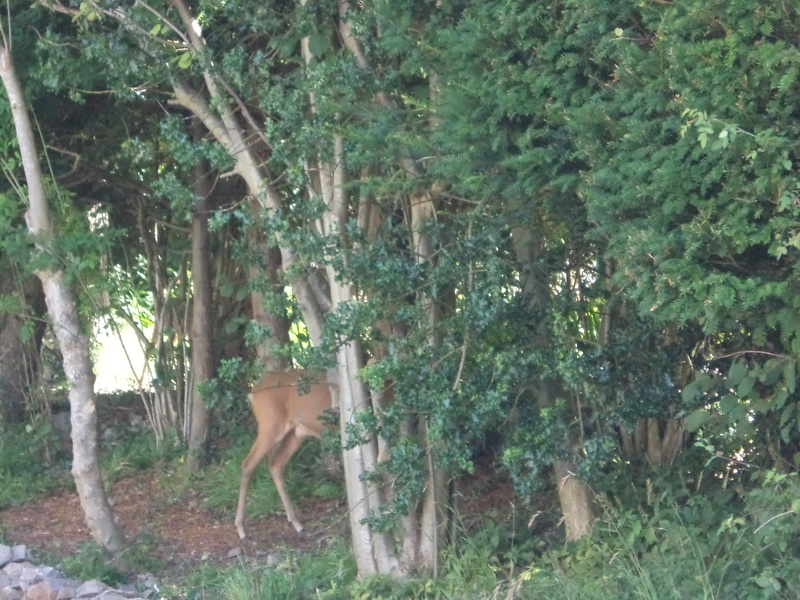 We caught sight of the roe deer alongside some holiday bungalows. 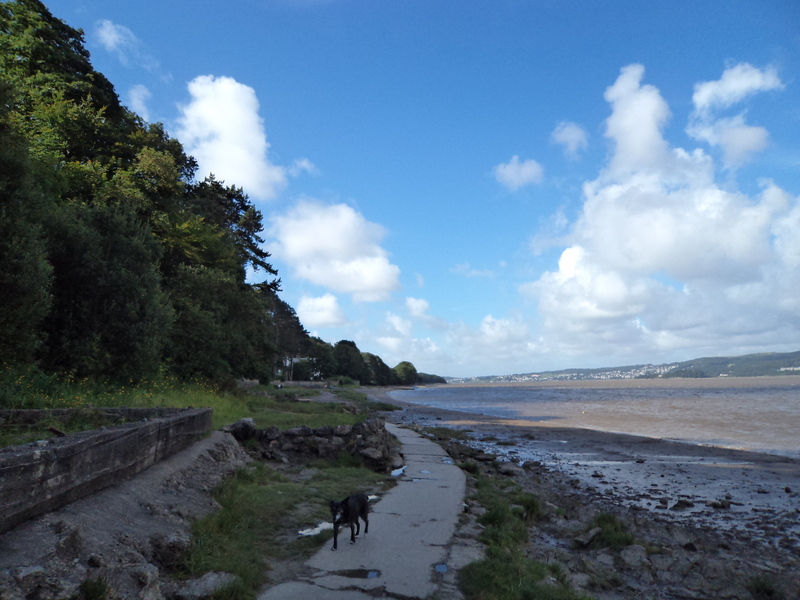 We returned alongside the estuary, looking out towards Grange-over-sands. 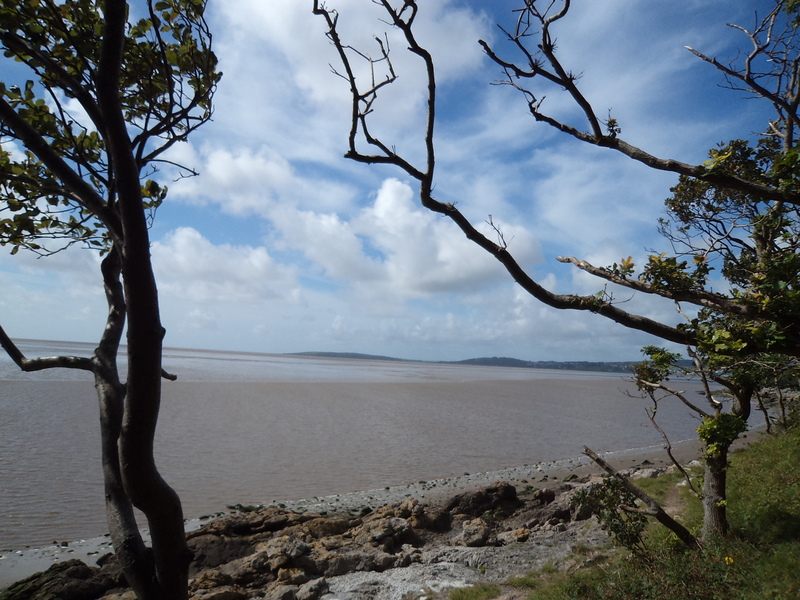 July 2nd and still managing to dodge the rain, the path westwards is alongside golden sands. 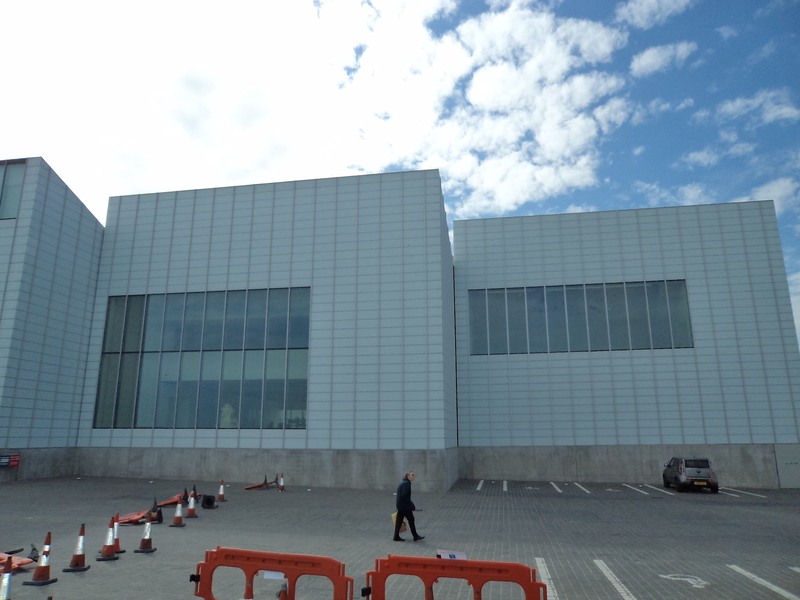 I cannot comment on the art within Margate’s new art gallery. 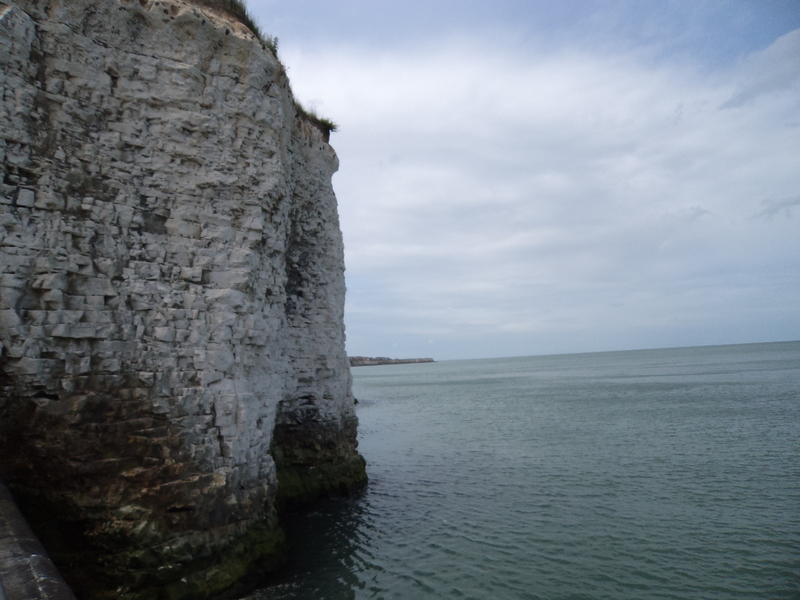 However, from walking past, I am able to say it seemed to have been built perilously close to the sea and to resemble a gigantic shed. 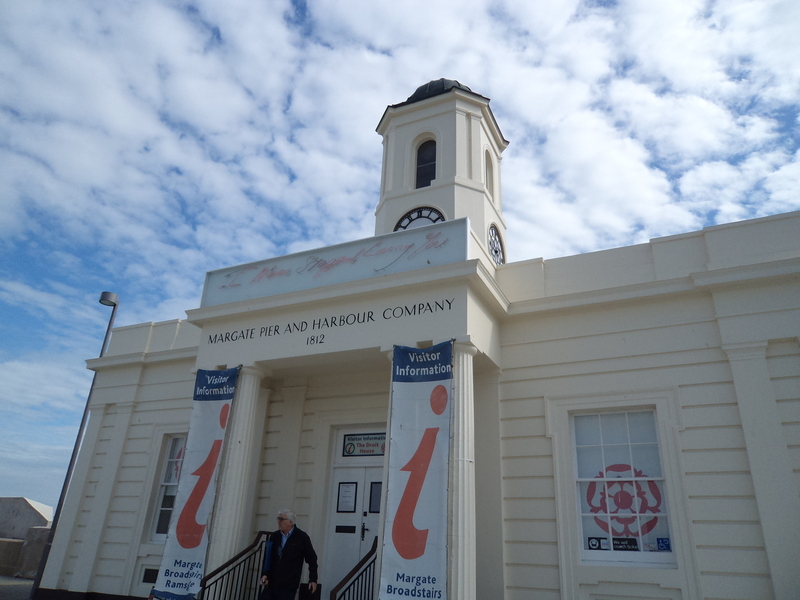 The tourist information nearby is in elegant early nineteenth century buildings from Margate’s genteel past when the aeroplane had not opened up the possibility of visiting resorts with more sunshine more easily. 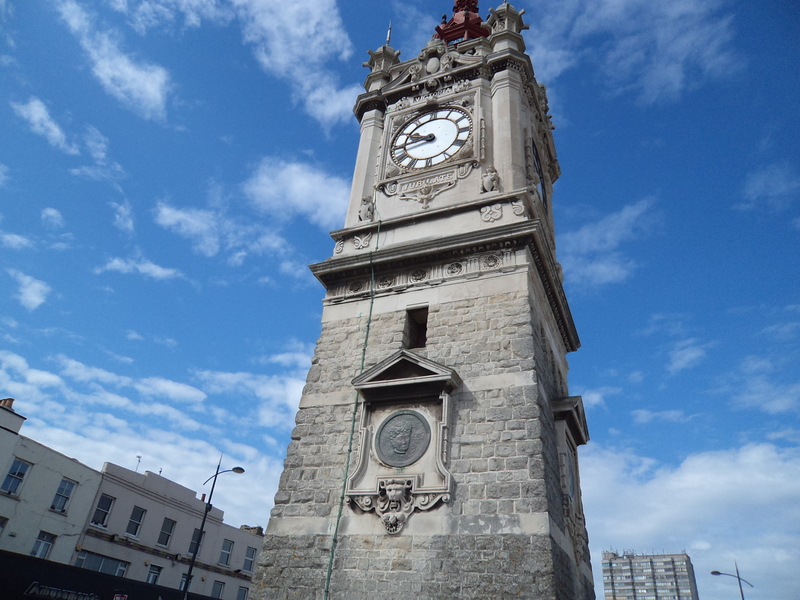 The clock tower celebrates Queen Victoria’s Golden Jubilee of 1887. 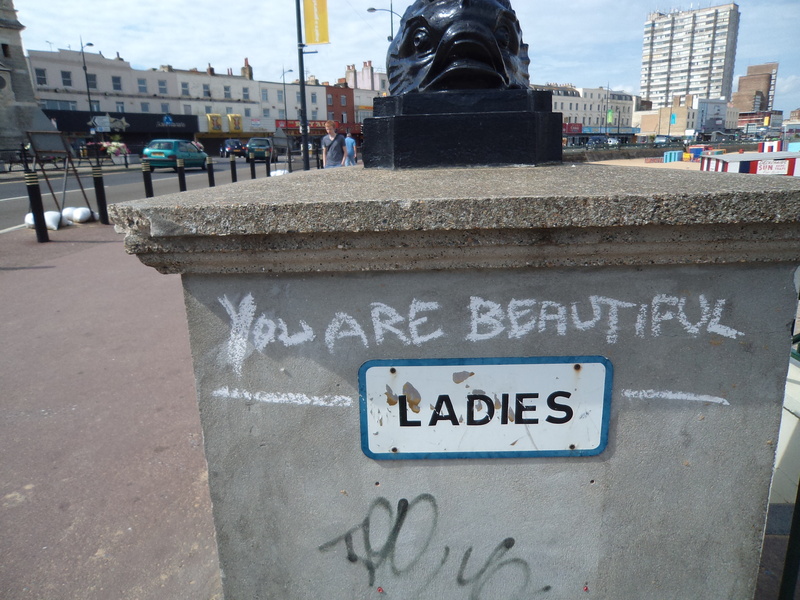 As graffiti goes, I found the above among the more charming. 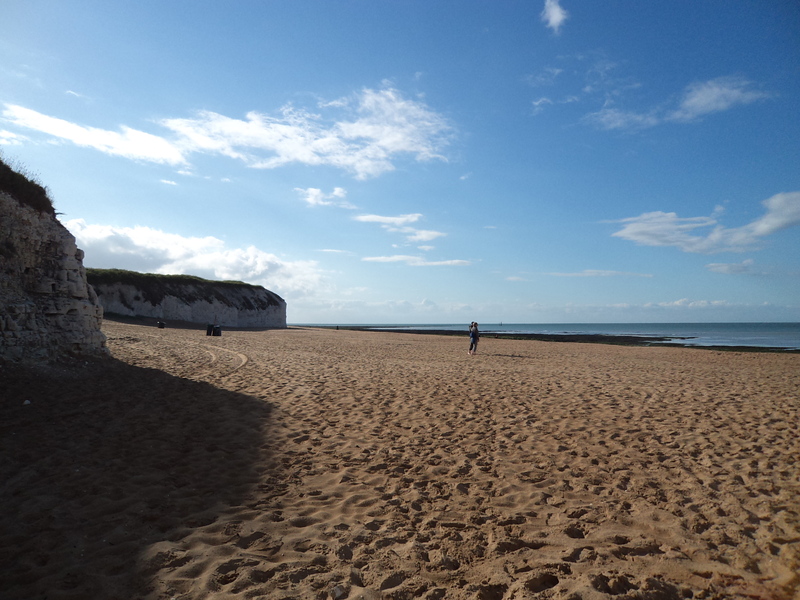 On a weekday before the school holidays began these sands were deserted. 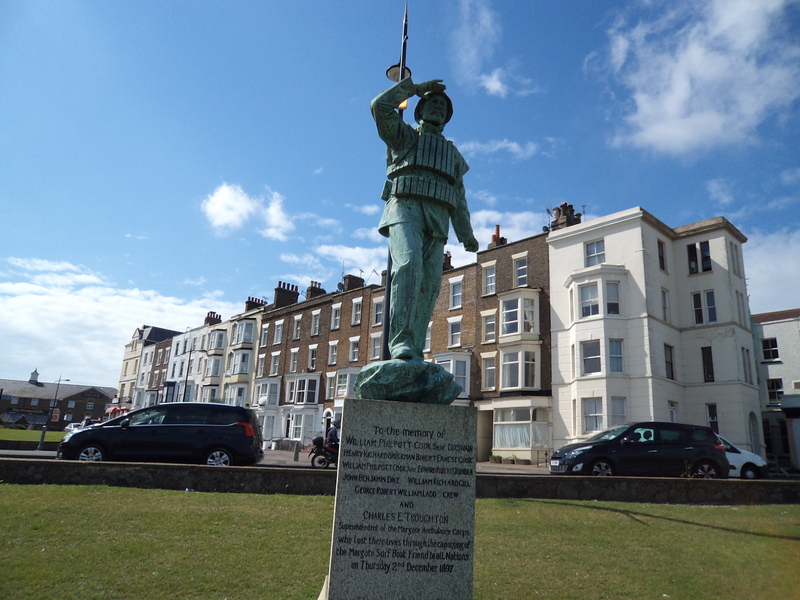 The heroism of the local lifeboat crew is commemorated by this statue. 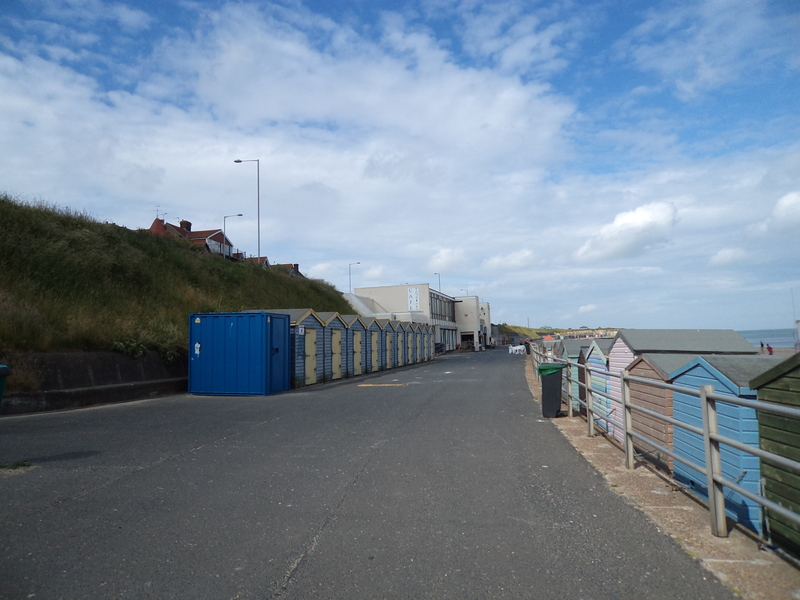 Surely there must be city dwellers who could have benefited from the use of these miles of empty beach huts! 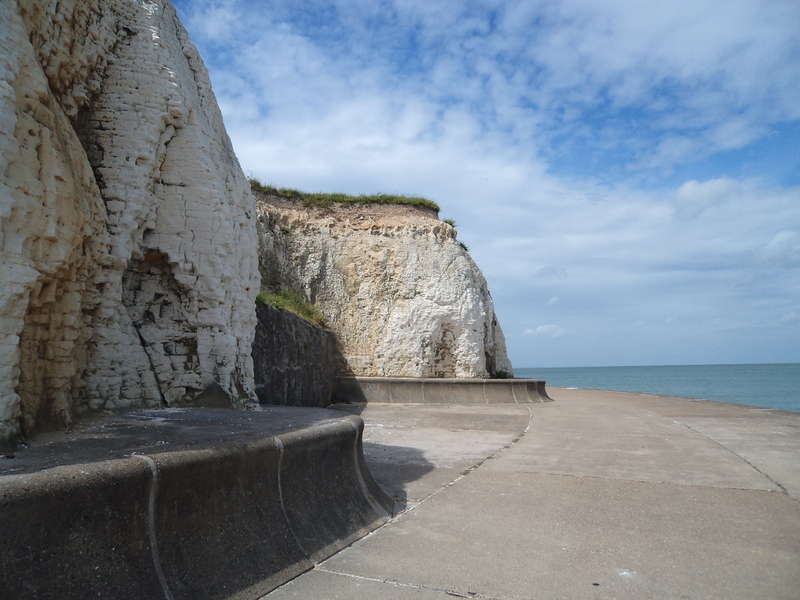 I walked on to Westgate on Sea, still hugging the coast. 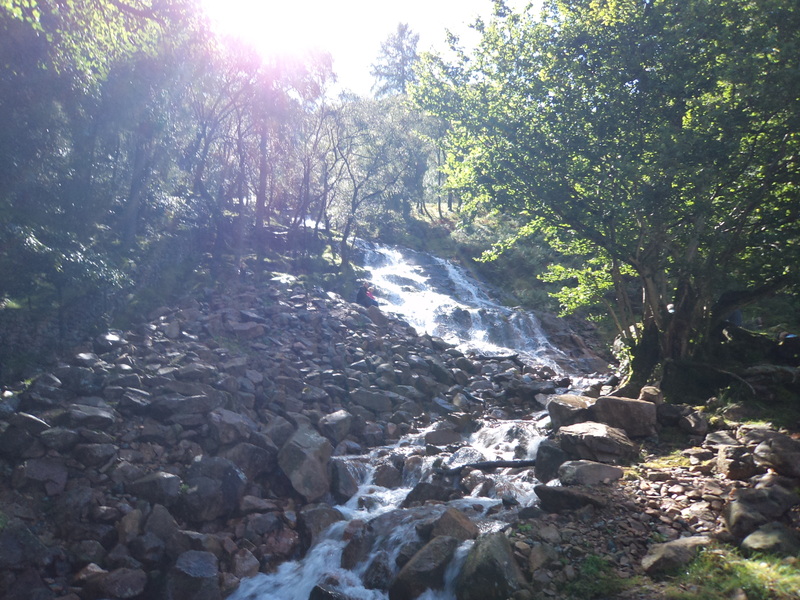 One feature of a walk like this is the ready availability of refreshments and toilets. The even-ness of the path is owing to the fact that it is shared with cyclists. 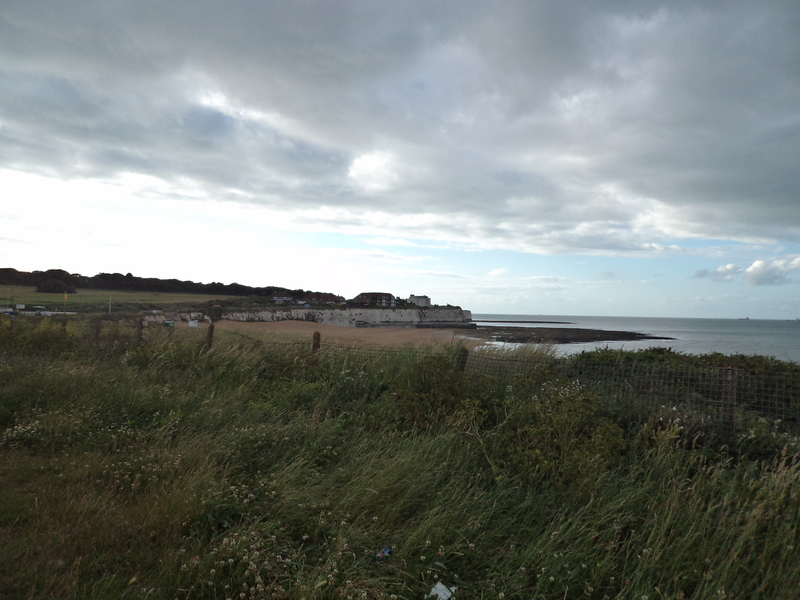 Eventually, just before Birchington on Sea, the path ran out and it was necessary to take the coast road. I returned by the way I had come to take an afternoon coach. 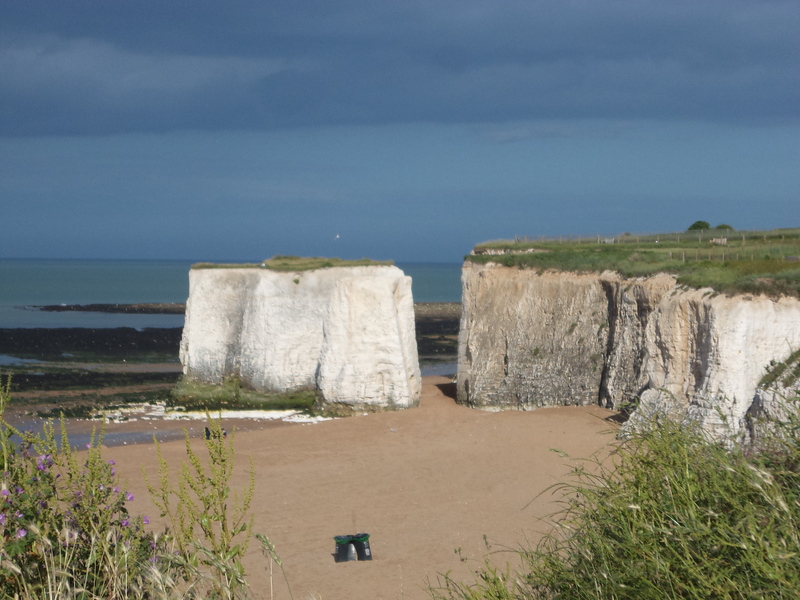 This would be an easy day trip by train from South London and the path continues from Birchington on Sea via Reculver, Herne Bay and Whitstable. 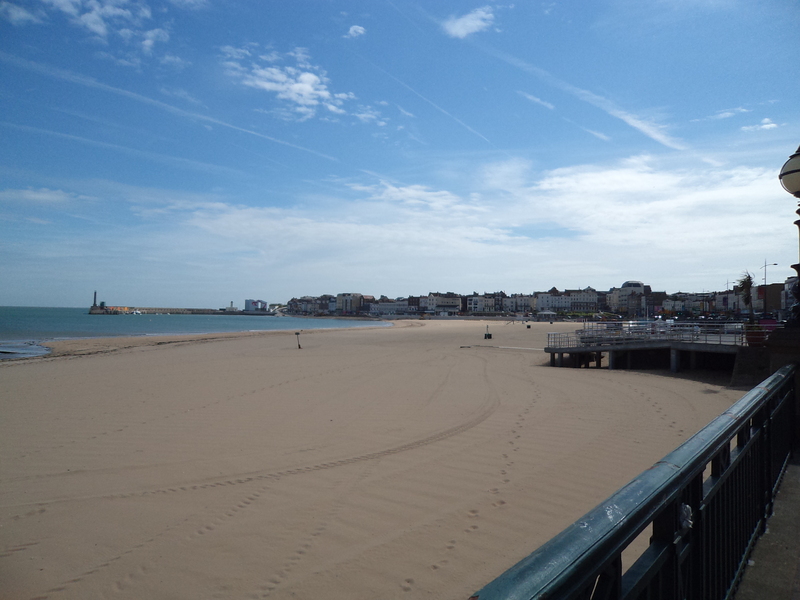 Past Walpole Bay, then Palm Bay: its golden sands deserted. 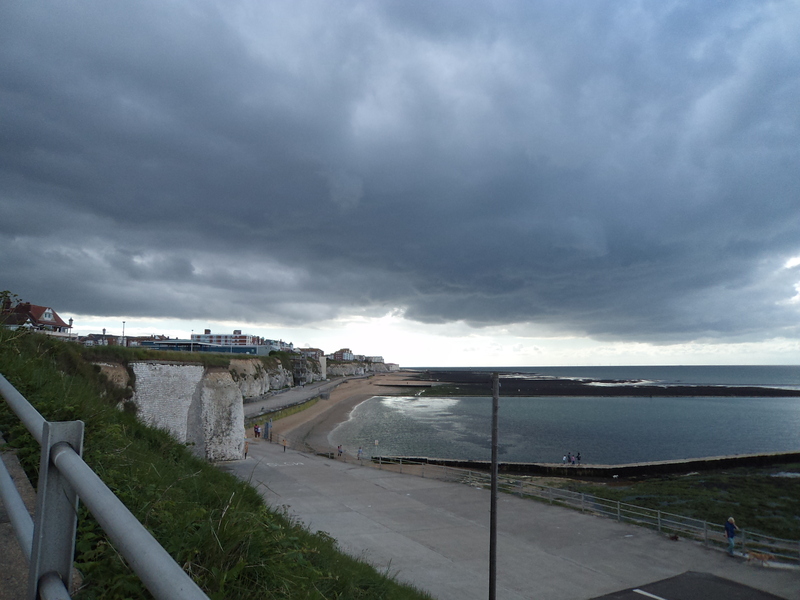 Whether this was owing to the weather or the school term or simply the fact that something dire seems to have happened to Margate in the sixties, I cannot say. A large wind farm could be seen off the coast. Which is where the residents of Sillfield in Cumbria would like to see the one in their next village. 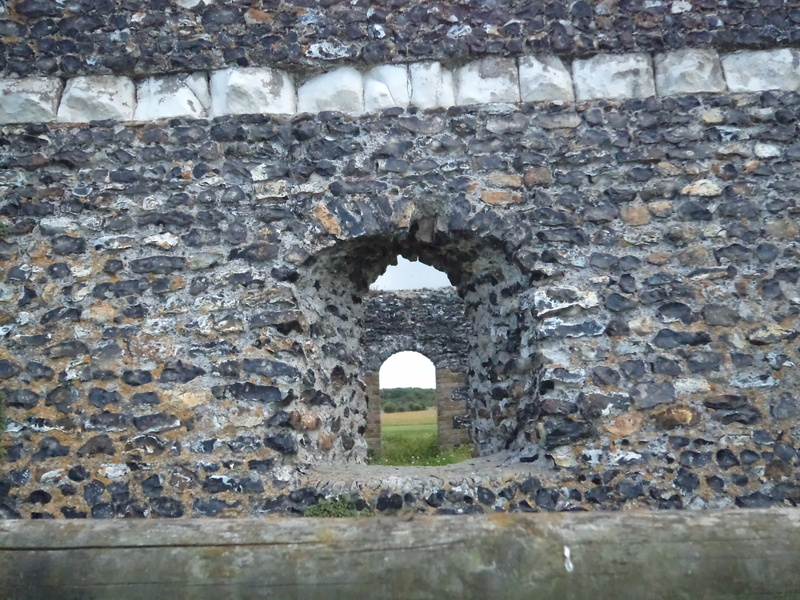 Rounding Foreness Point, I was not surprised to see a fortification. 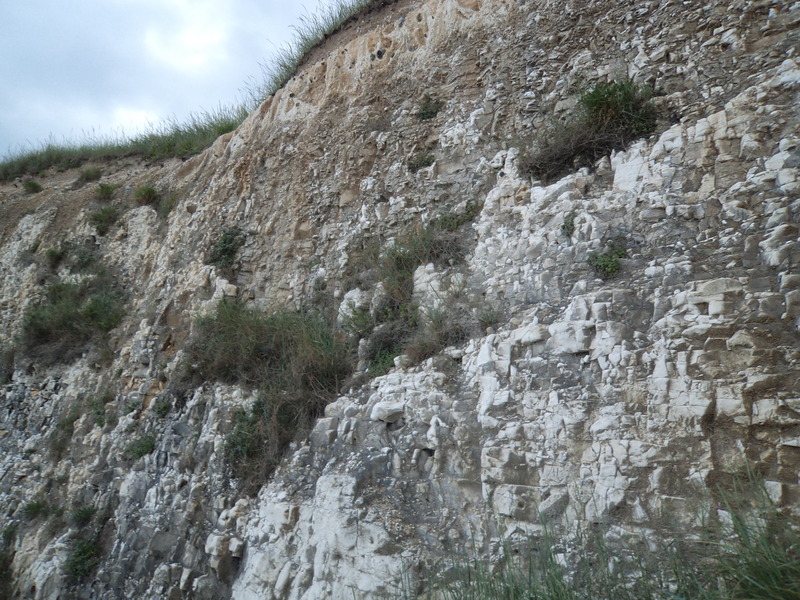 After all, this is the coast facing our historical enemy. There’s a teeny stretch of (rather dangerous) road here at Kingsgate. A sign on the gate helpfully gave information about this imposing building. 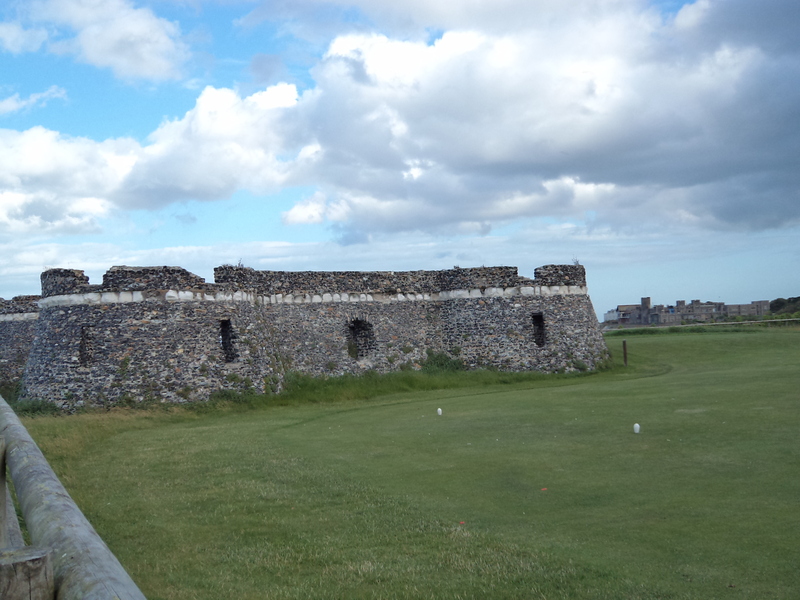 It tells us that Kingsgate Castle was built in 1760 by Henry Fox, the first Lord Holland. Later it became the residence of John Lubbock, the first Baron Avebury whose arms adorn the main gateway. It is now divided into private residences. I hadn’t realised that the present Lord Avebury, whose victory for the Liberal Party at Orpington in the 1960s prompted the satirical programme ‘That Was The Week That Was’ to illustrate how Liberals believed that Orpington was the centre of the world, had quite such a splendid past. 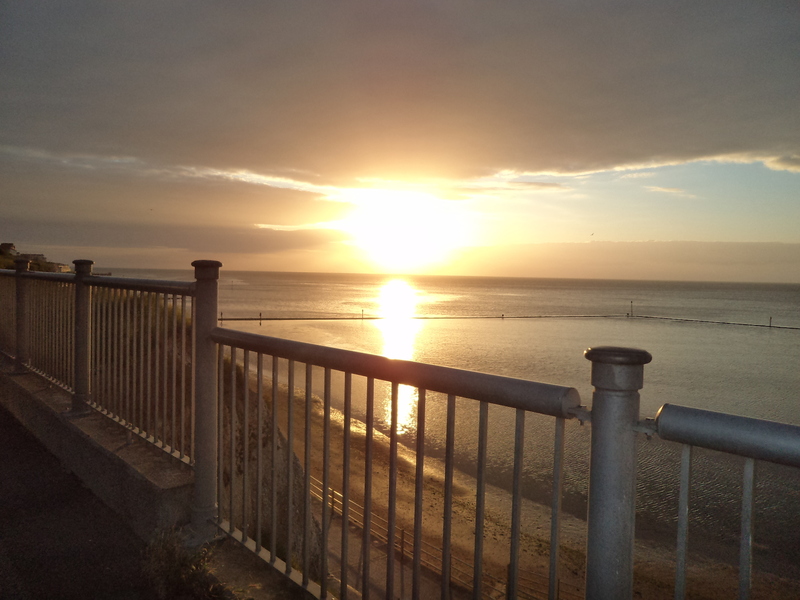 The weather on the return journey was ominous but having had dinner, I was able to enjoy the sight of the slowly darkening sky as the sun set over the sea. This evening view was a welcome change from life in the city. 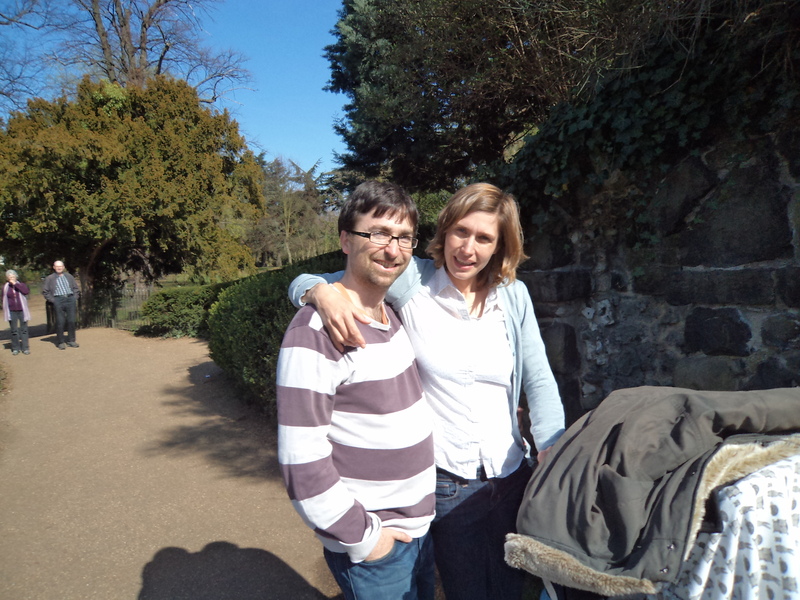 We didn’t realise it on April 1st, but the good weather we enjoyed for this walk was to be followed by two unseasonally cold and wet months. 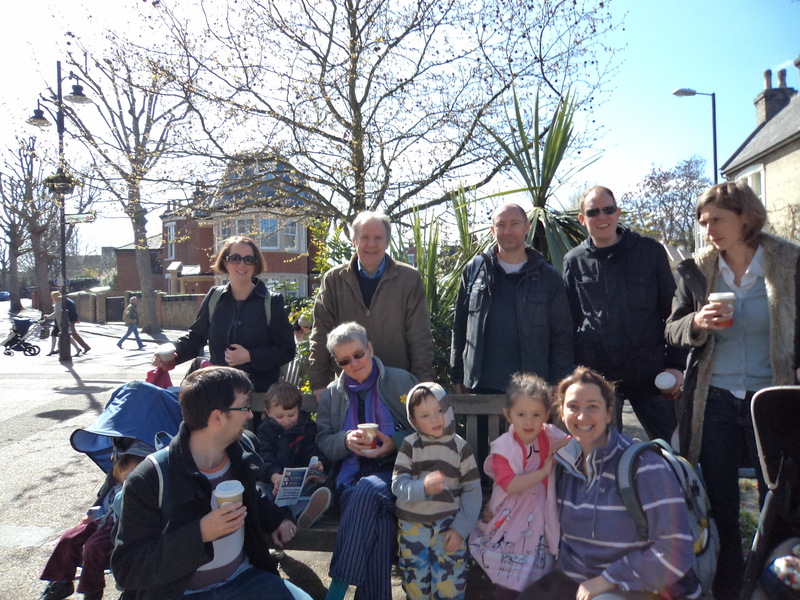 Having met at Kew Gardens Station we headed for the river. Fairly soon we stopped off at a riverside pub for lunch at Strand-on-the-Green. For this walk I was guided once again by ‘Andrew Duncan’s Favourite London Walks’ Having left the river we walked through the grounds of Chiswick House. Progress was slow owing to the presence of five young children under five, who found much to interest them along the way. 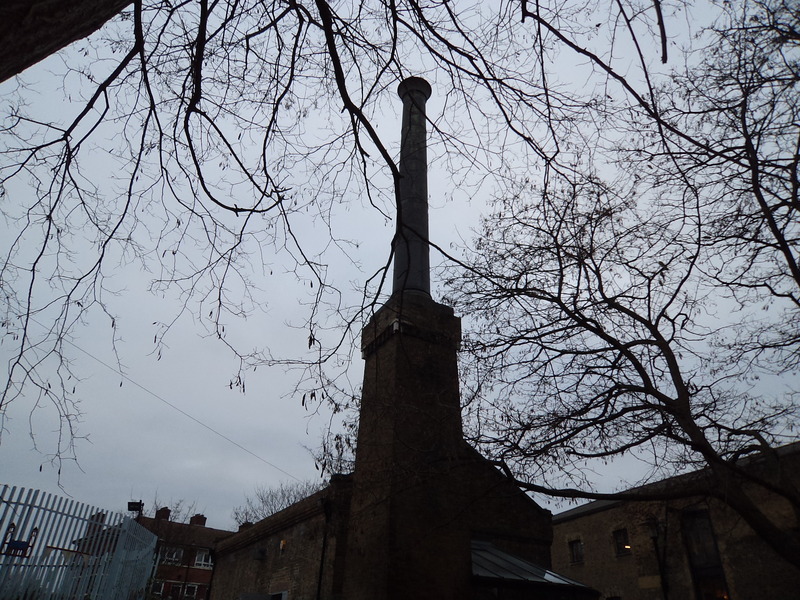 Thence we joined up with the towpath again along the Thames and through Chiswick village. 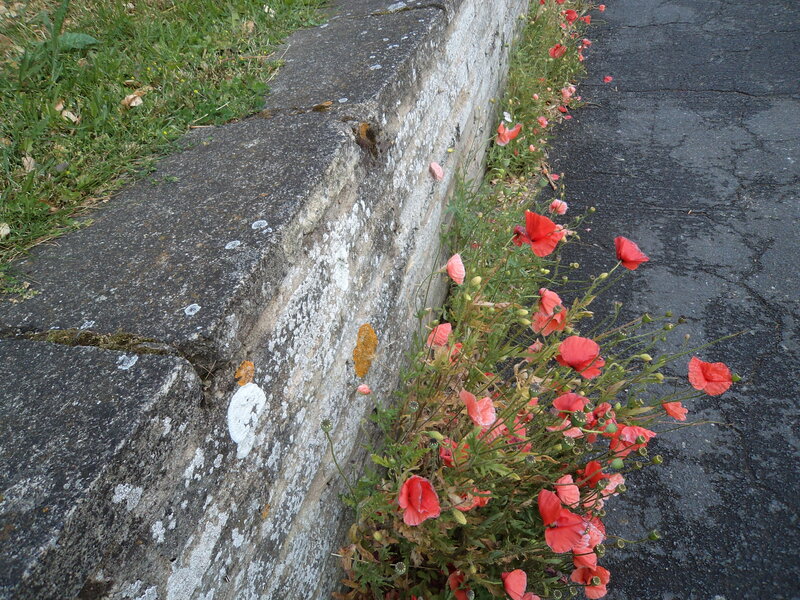 We enjoyed walking past historic houses, some, the guidebook points out, associated with the Arts and Crafts Movement. 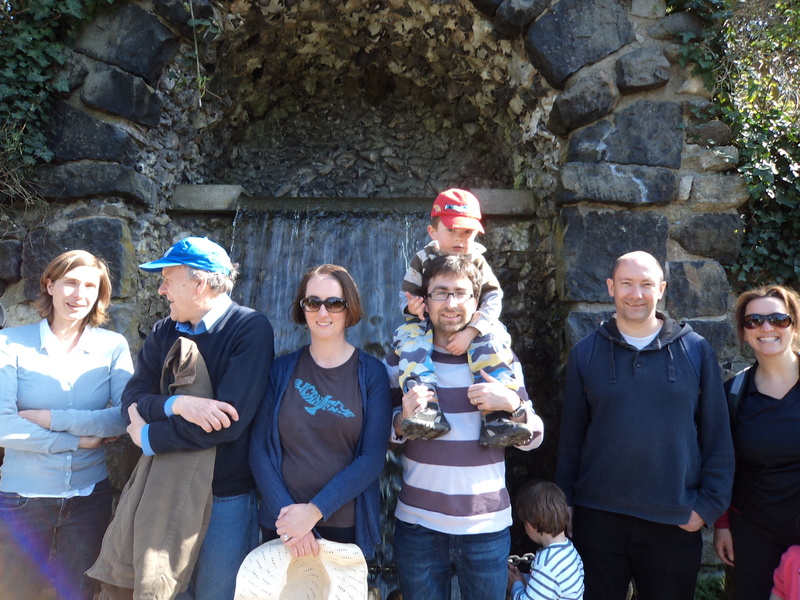 However our younger walkers found other attractions claimed their attention. 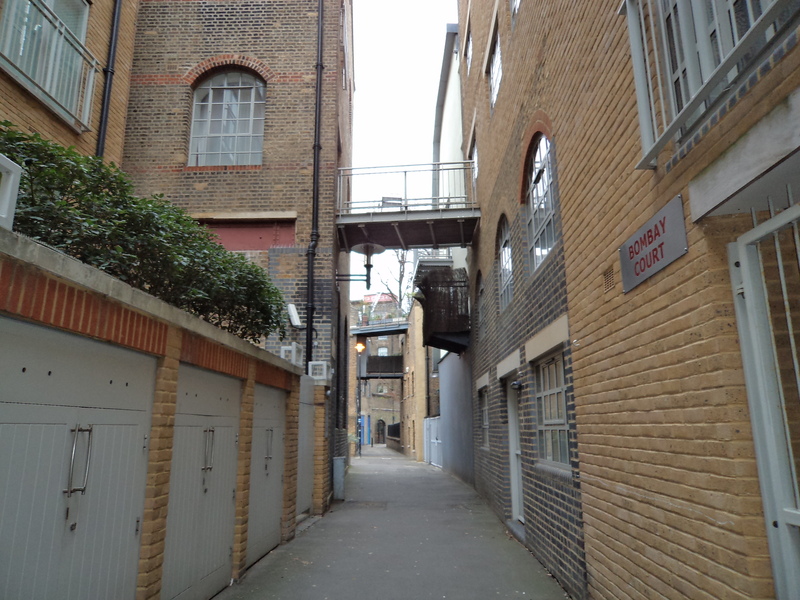 This walk of 4.5 miles had taken all of this sunny afternoon and it was getting on for bed time when we reached Hammersmith station. 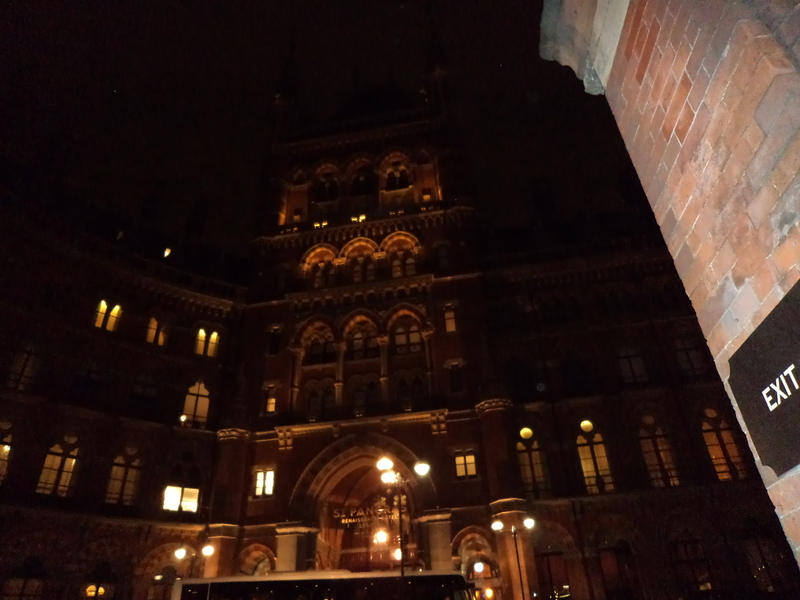 Some railway stations in London are charming even grandiose, others are of the utmost dullness. 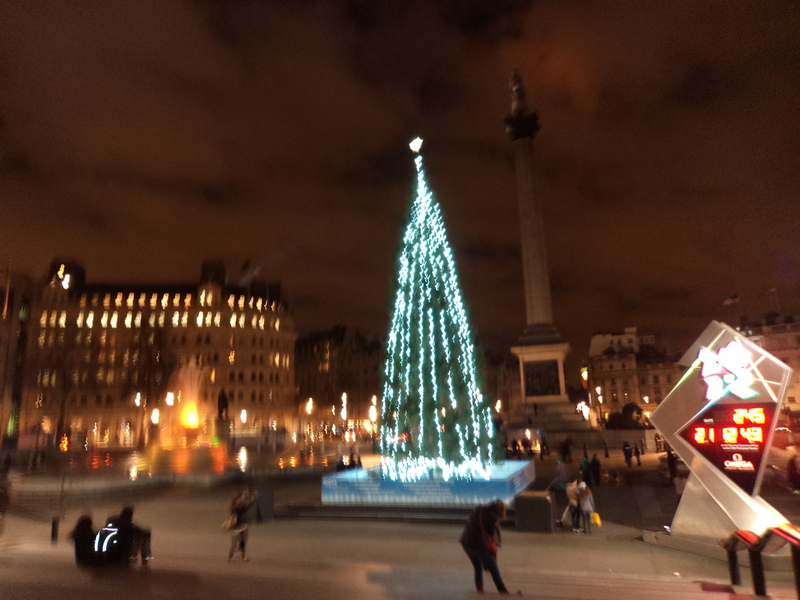 As I approach the end of this walking challenge,a walk between them gave a review of previous walks in the city and reflected all its amazing variety. 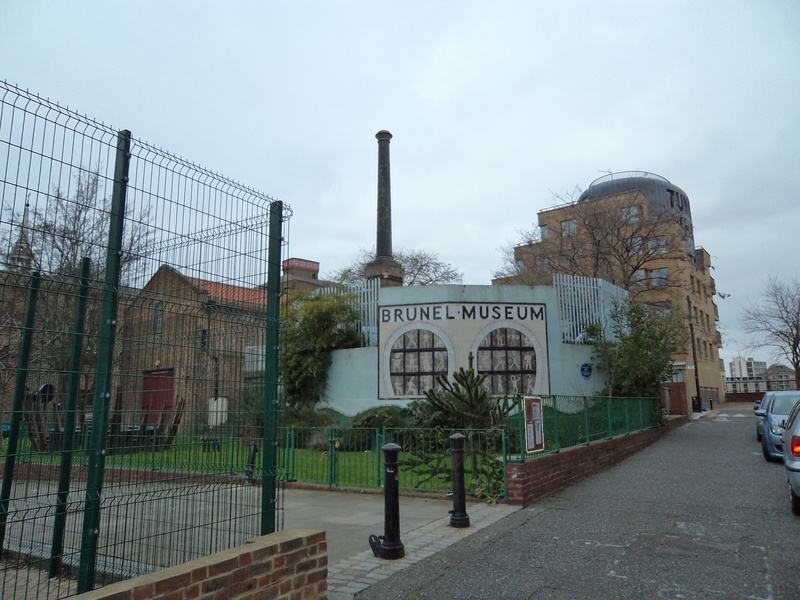 Marc Brunel, father of Isambard Kingdom Brunel was the engineer on this project. It was unsuccessful financially as no road approaches were built which would have enabled the projected freight traffic. 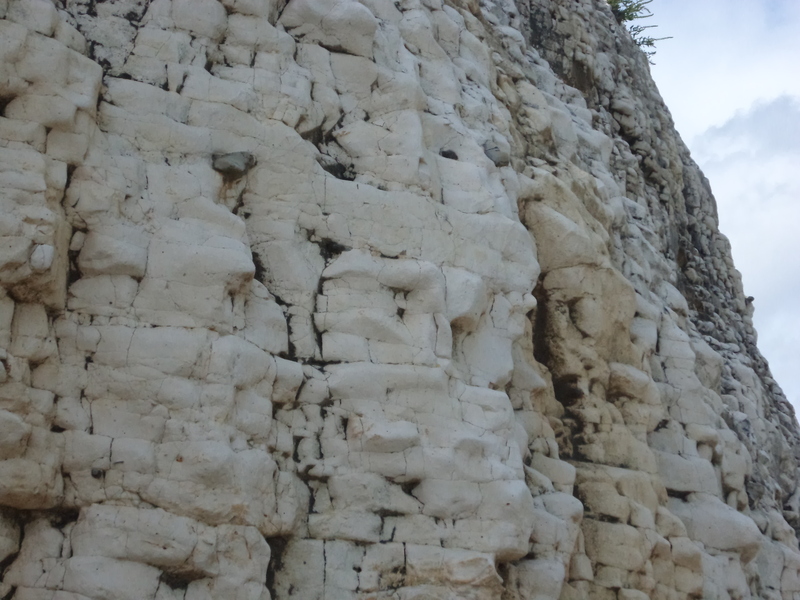 His talented son nearly lost his life when he was working on the project. 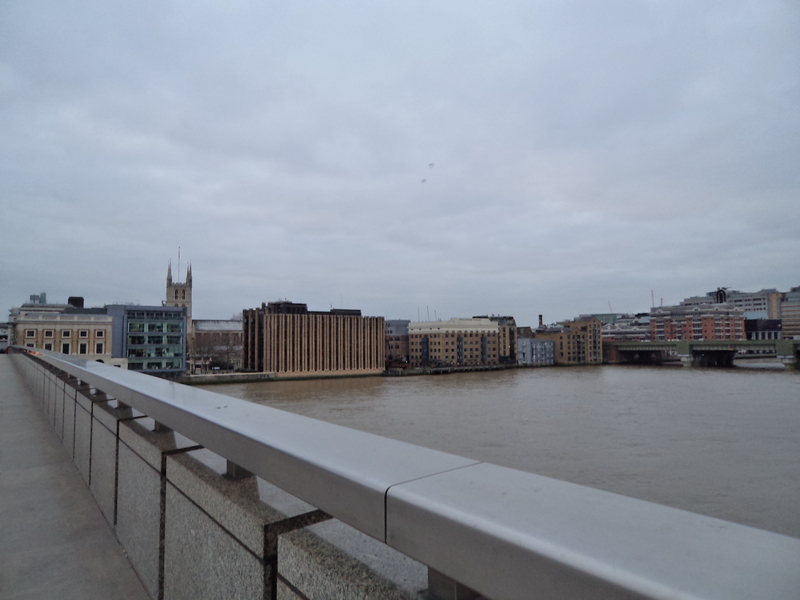 I learnt much about Isambard Kingdom Brunel and was pleased to see that I had seen many of his great works including the Maidenhead Bridge, when I was walking the Thames Path. 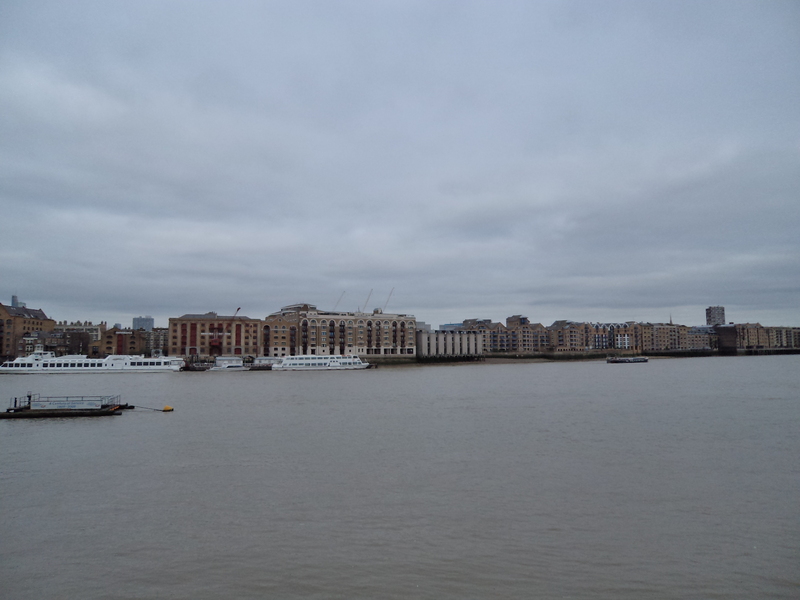 Here the river is relatively narrow, which is why Marc Brunel chose Rotherhithe for the site of his tunnel. 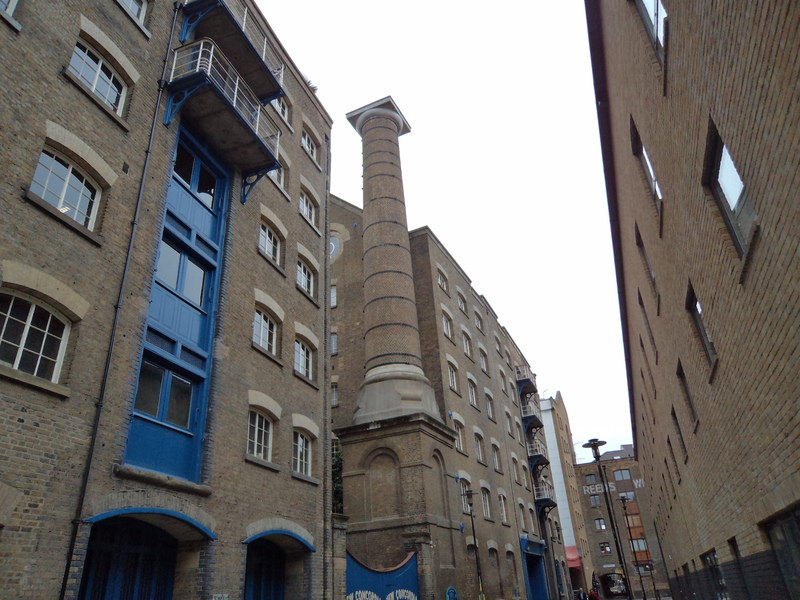 The warehouses lining the river may once have stored timber, hemp, iron, tar or corn. The bridges were for the speedier transport of goods. 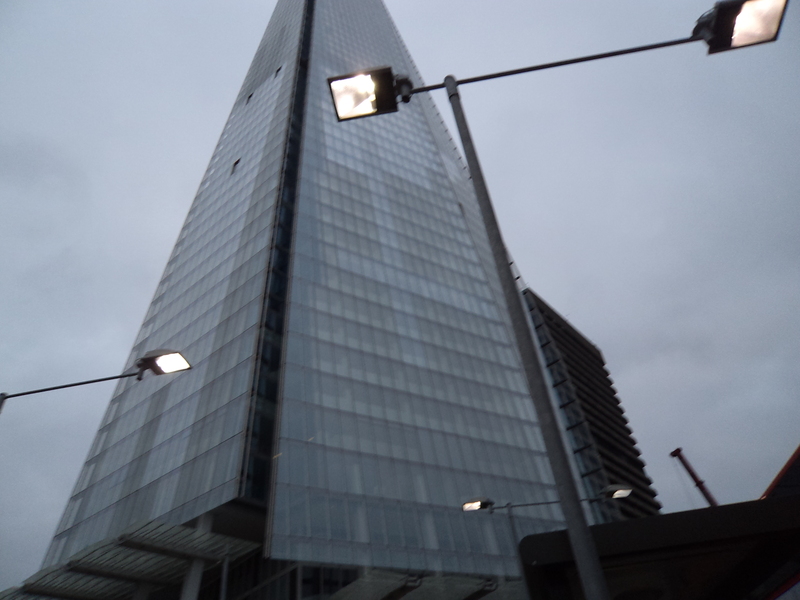 After almost two miles I reached London Bridge, in its present state as a building site, an unprepossessing and confusing station. 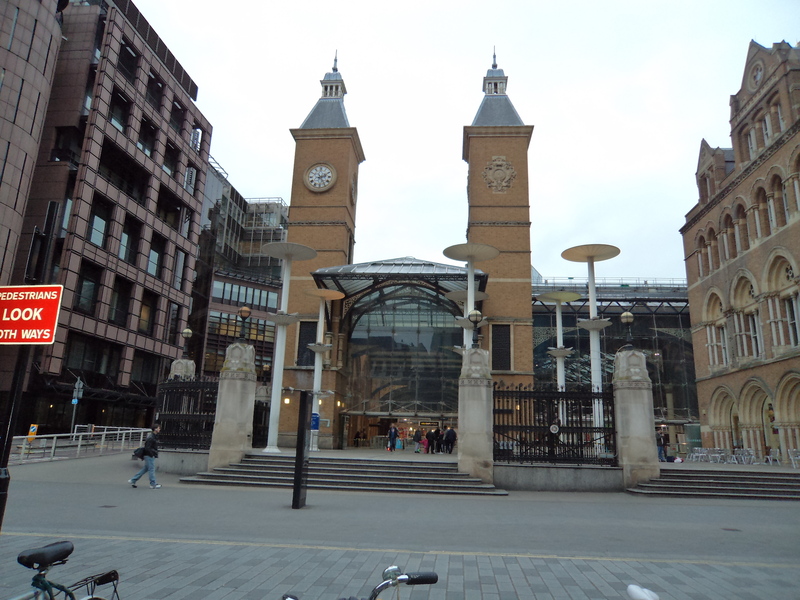 When I first moved to Hertfordshire in 1980, Liverpool Street Station was being rebuilt. 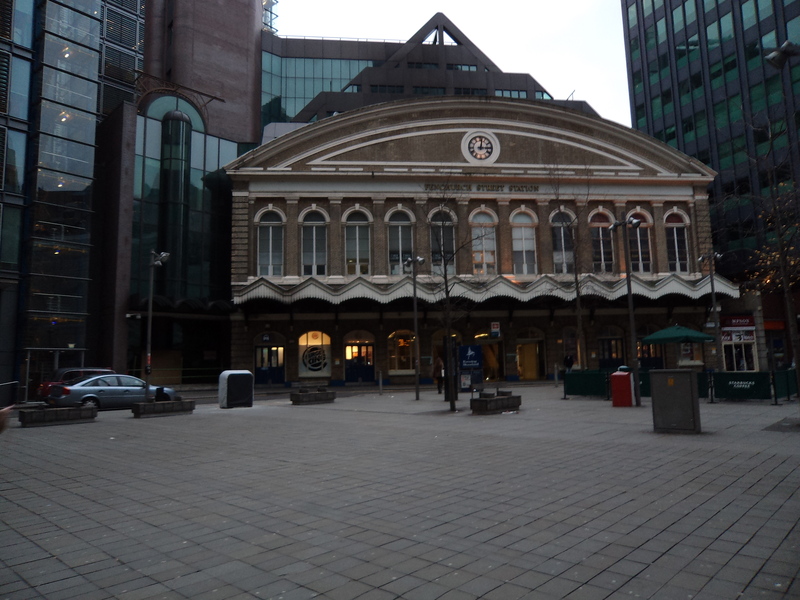 The adjoining Broad Street station was ‘redeveloped’. 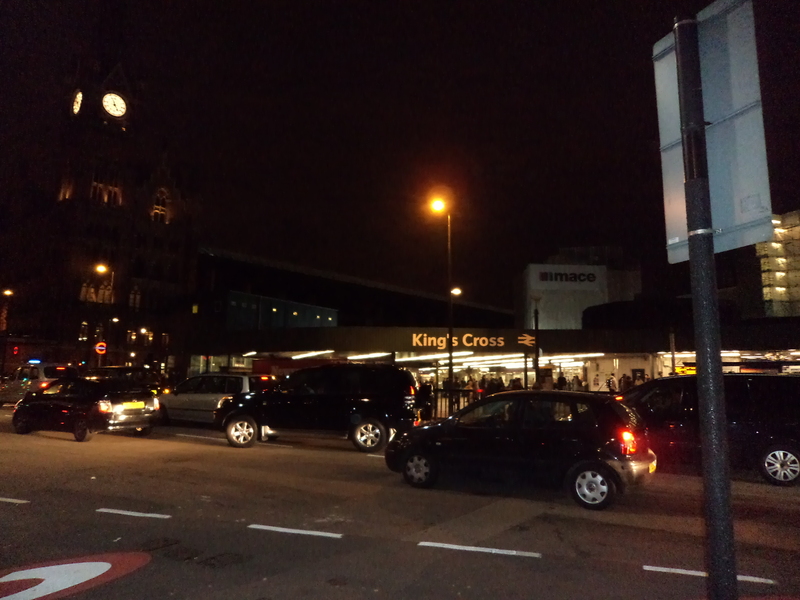 It’s the busiest of all British stations and frequently the lines are congested. The trains run to Hertfordshire, Essex and a long way round to Cambridge. The Stanstead Express costs more than many of the tickets for the airlines which use the airport and is very snazzy. The lines to Hertford East and Enfield Town are woefully shabby. 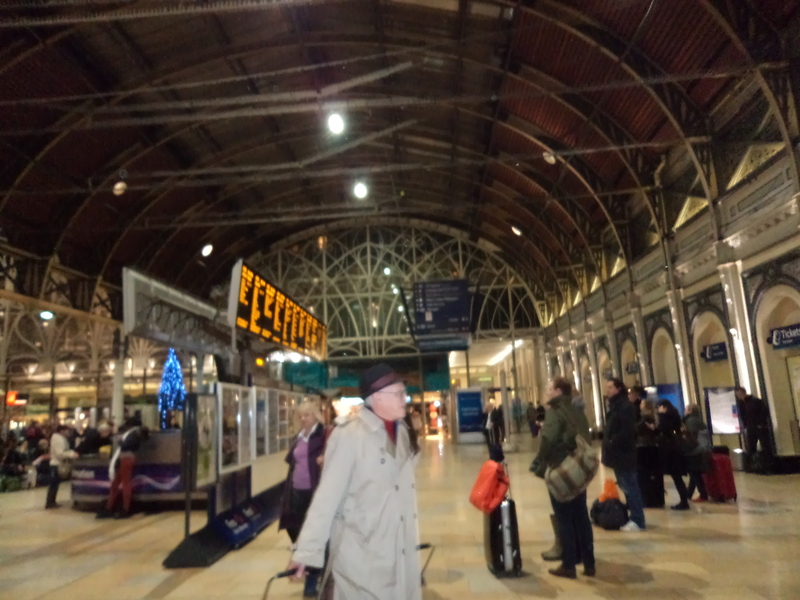 Fenchurch Street Station is charming. 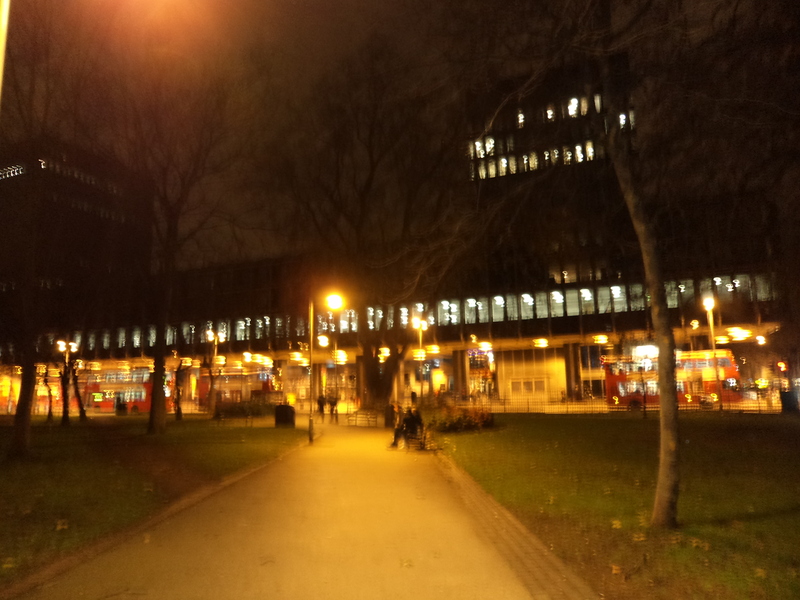 I took the trains from here when I walked those parts of the Loop which are in Essex. 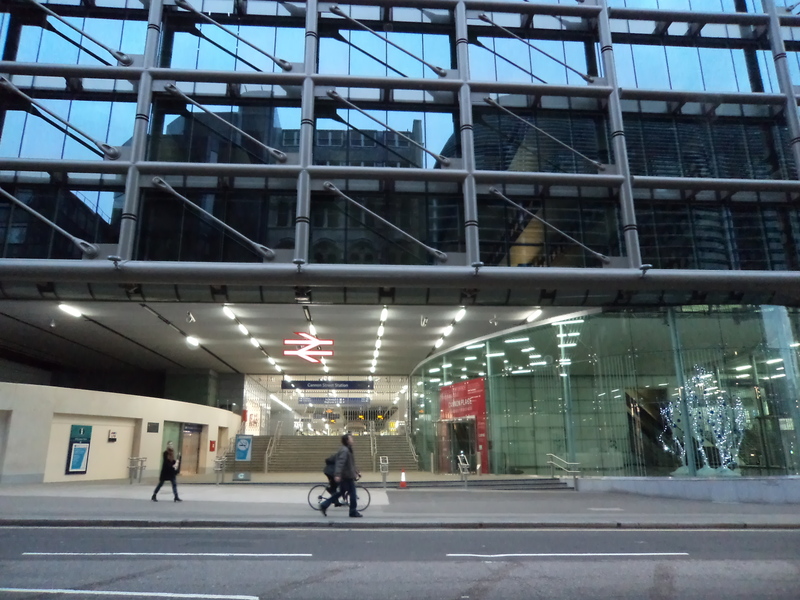 The startlingly shiny Cannon Street was closed on this Bank Holiday. 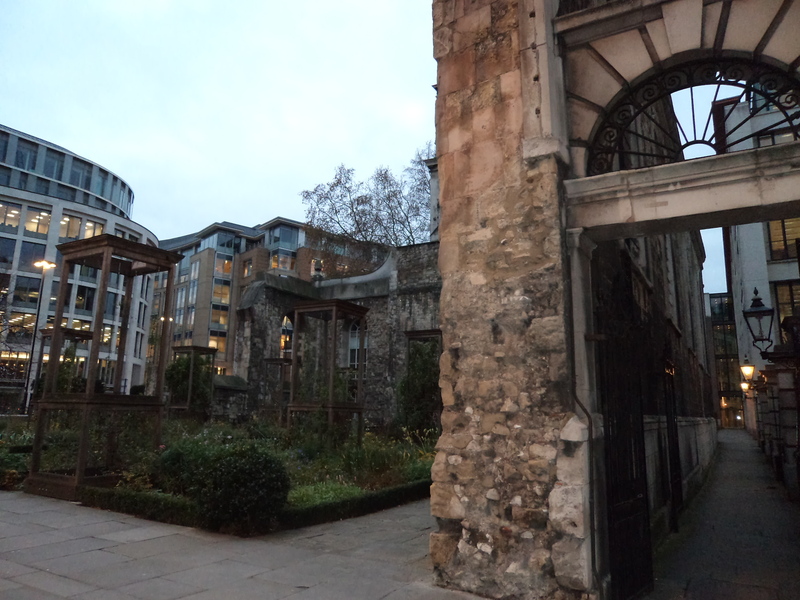 I headed now for another cluster of stations on the Euston Road and so made my way over the Holborn Viaduct.These ruins show what a near miss St Paul’s had in the Blitz. The buildings here are less showy than in the City. 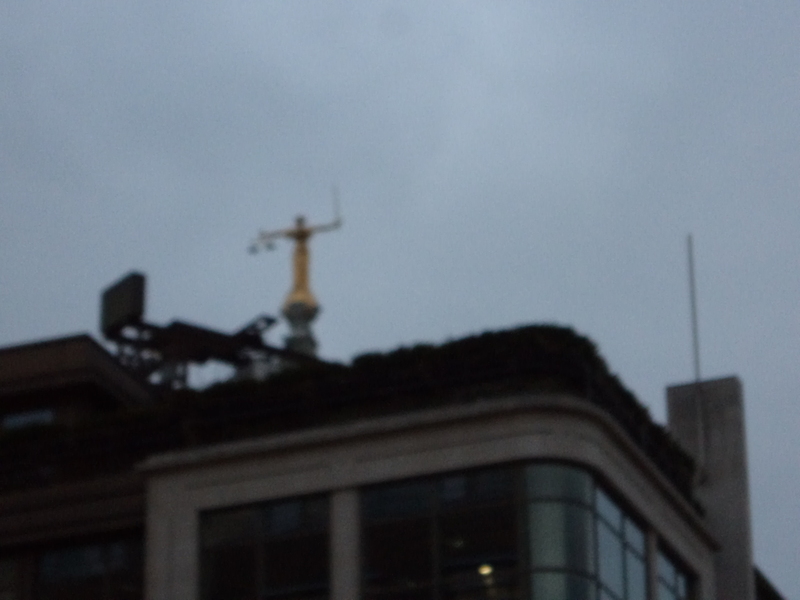 This is the legal district and Justice can be seen overlooking the area holding aloft her scales. She is my Christmas toast and in her I put my hope for the New Year. 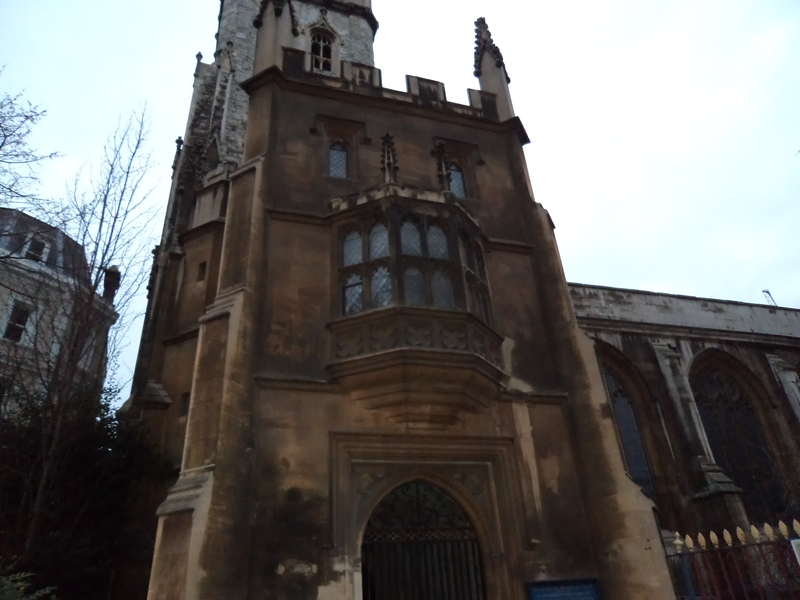 Among numerous very ancient churches that I passed is St Saviour without Newgate. 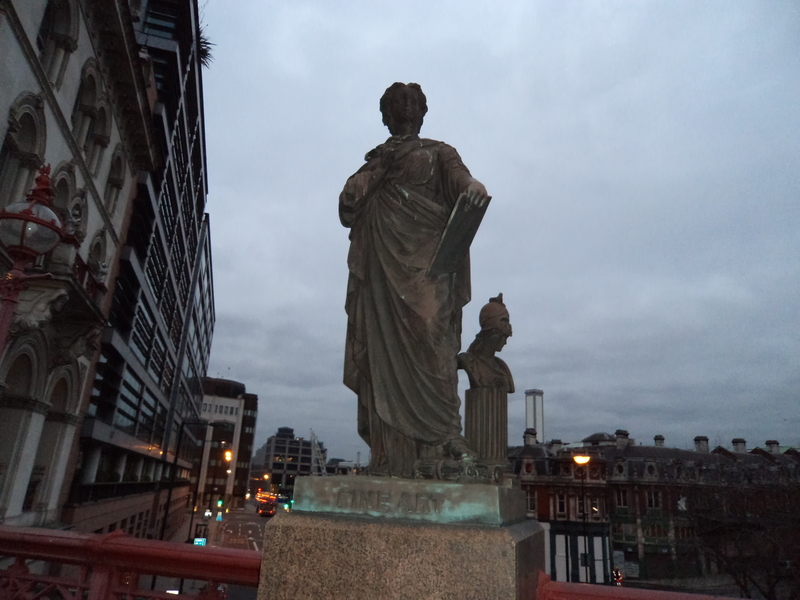 As befits the more learned character of the district, Holborn viaduct is adorned with allegorical figures. 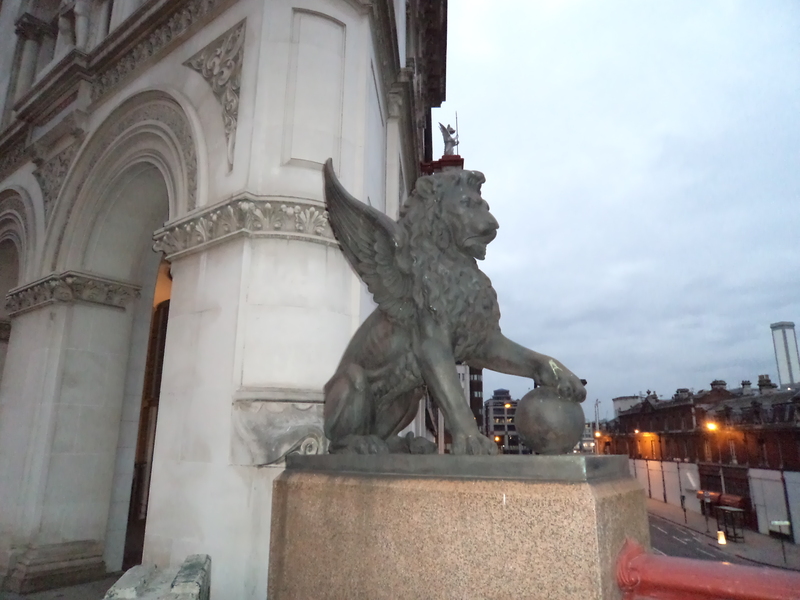 Here is Fine Art and a winged lion. 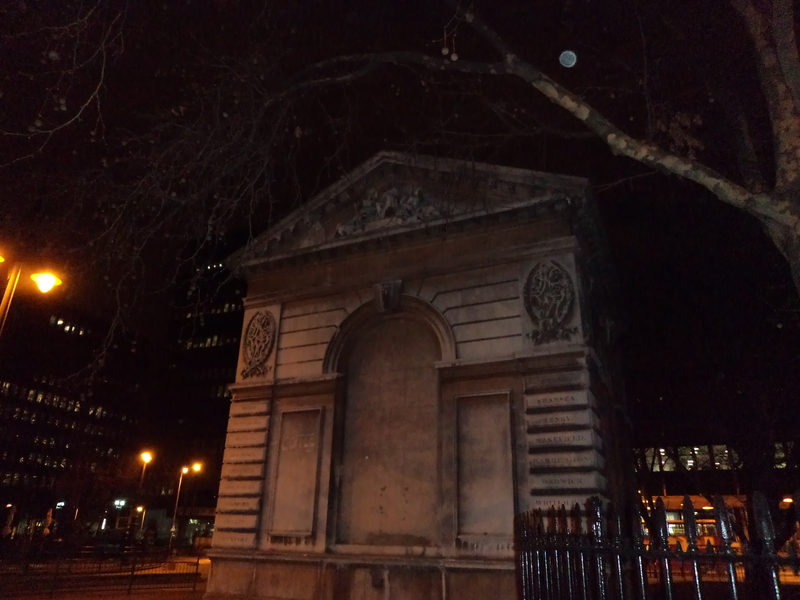 Sir William Walworth, twice Mayor of London stands guard in a niche in this ornate building. He killed Wat Tyler. 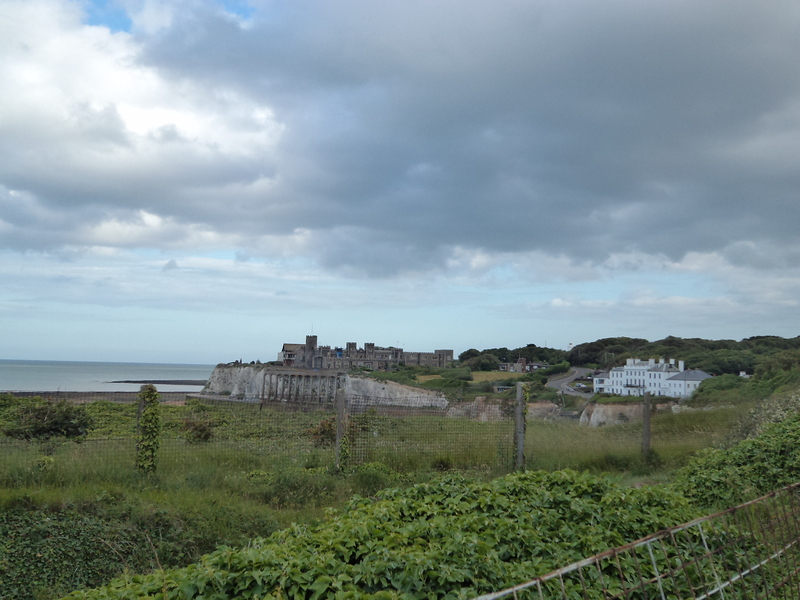 A utilitarian building, it nevertheless serves the entire East Coast of Britain. My grandmother told me that we had ancestors who came ‘down south’ as they were master craftsmen and worked on the building of St Pancras. The most magnificent of stations; the name Betjeman is preserved in a waiting room as tribute to the poet laureate, who did much to save this most worthy Eurostar terminal. I remember the rebuilding of this too in the sixties. 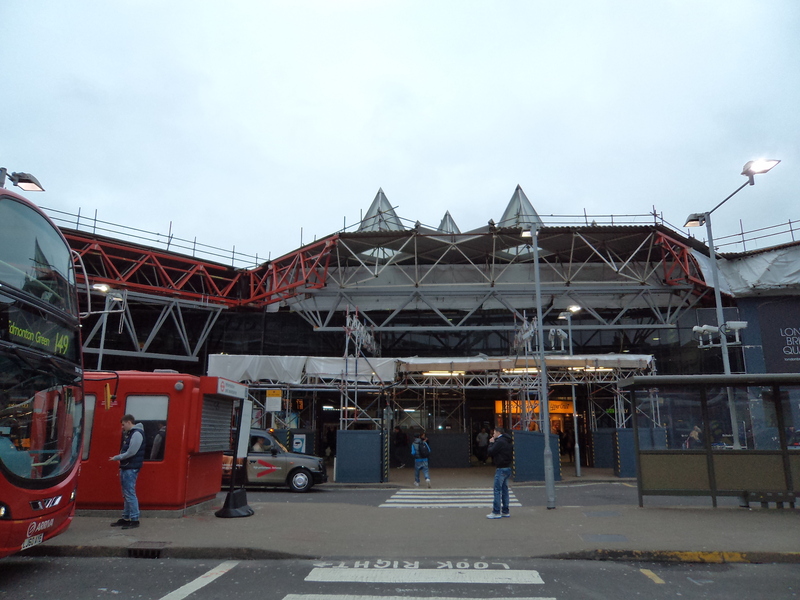 This is the station where I boarded a train home and I can never go there without a pang of remembrance for my parents. There’s a beautiful song by Davey Arthur, called Euston Station, a tape of which I inherited from Charlotte. It portrays the longing for home of the expatriate Irish in London ‘If you long to be somewhere then go while you can’ Kings Cross and Euston are the two stations which lead to the North, and as such are the most difficult for me to walk past without acute pangs of nostalgia. 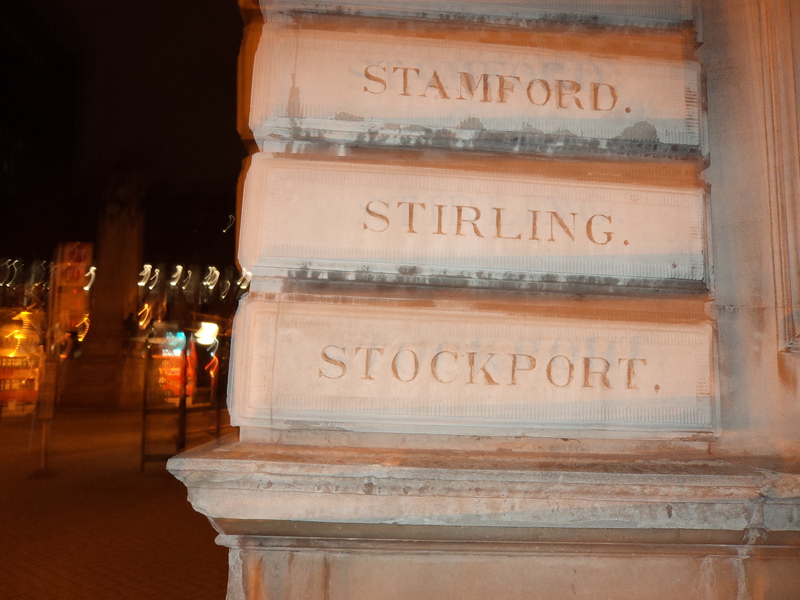 Two entrance lodges to Euston station were saved.Inscribed on them are names of towns served by the railway, including Stockport, where I first boarded a train for London en route for my first trip to France. 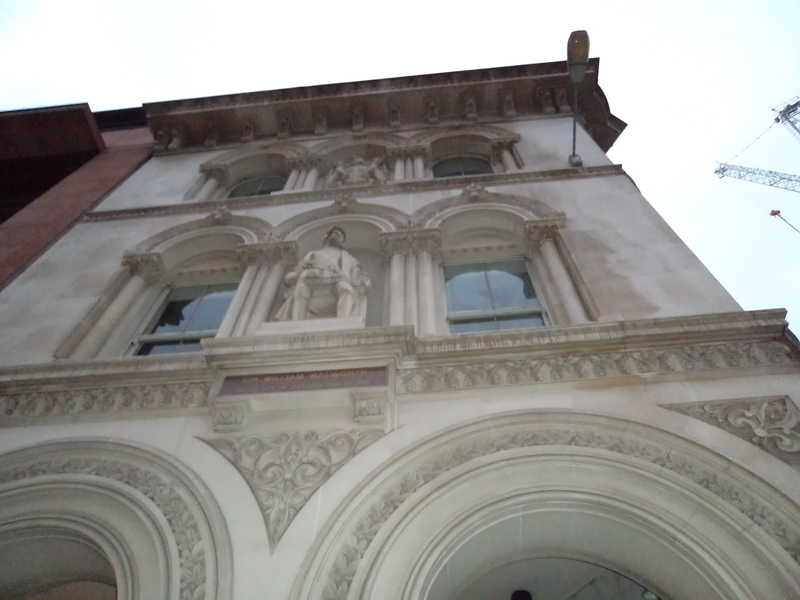 Walking along the Euston Rd and then the Marylebone Road, the architecture becomes Regency. 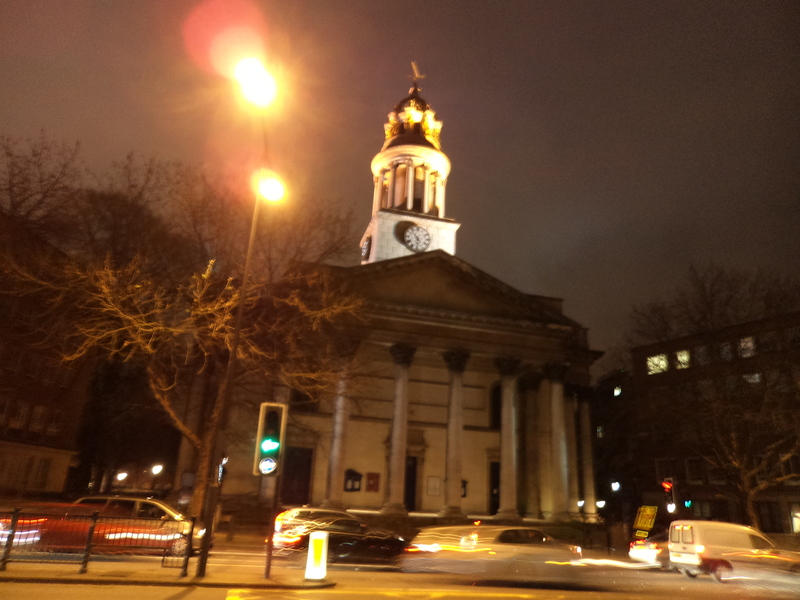 St Marylebone Church is where Elizabeth Barrat secretly married Robert Browning. 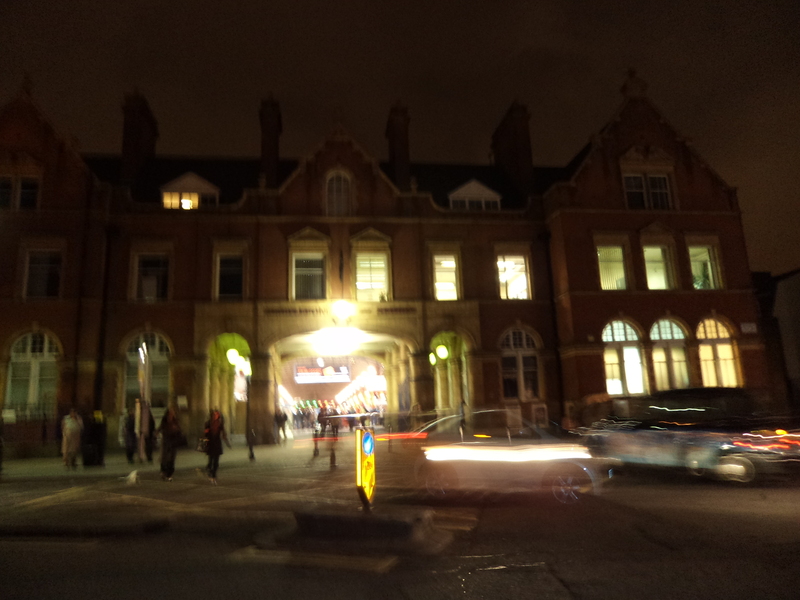 I had never visited Marylebone station. ( For fashionistas it’s where you take a train to the designer outlet centre at Bicester.) I found it a charming homely station. 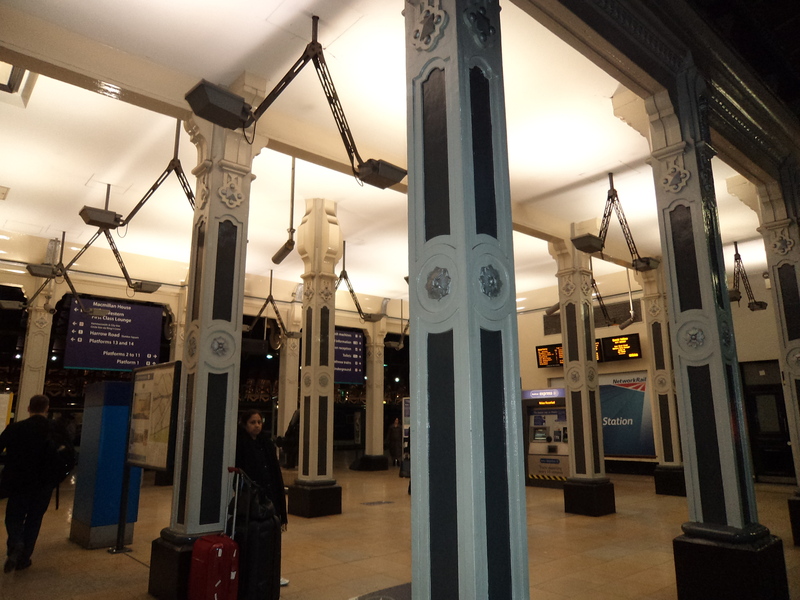 Not every station has a work of art outside it but that is what the Charing Cross Station has. It’s a replacement for the original thirteenth century cross commissioned by Edward the First in memory of his queen, Eleanor. 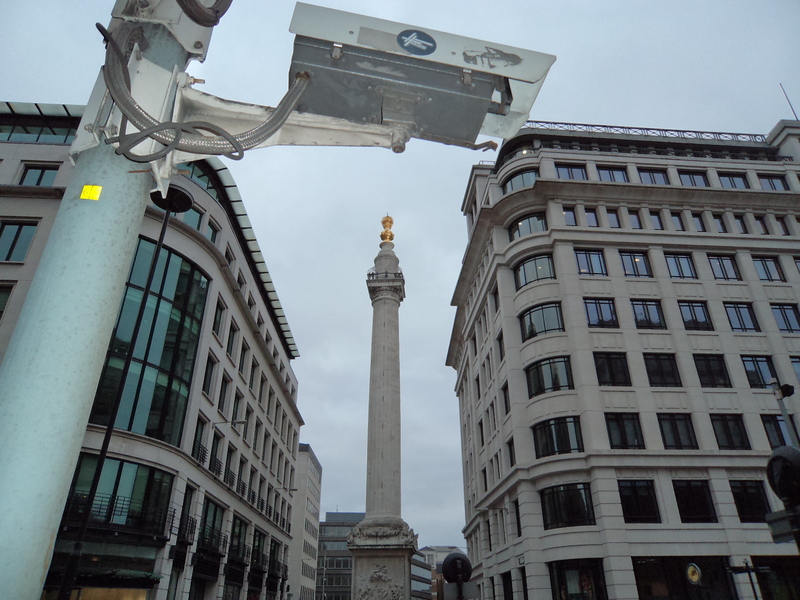 This marks the centre of London. 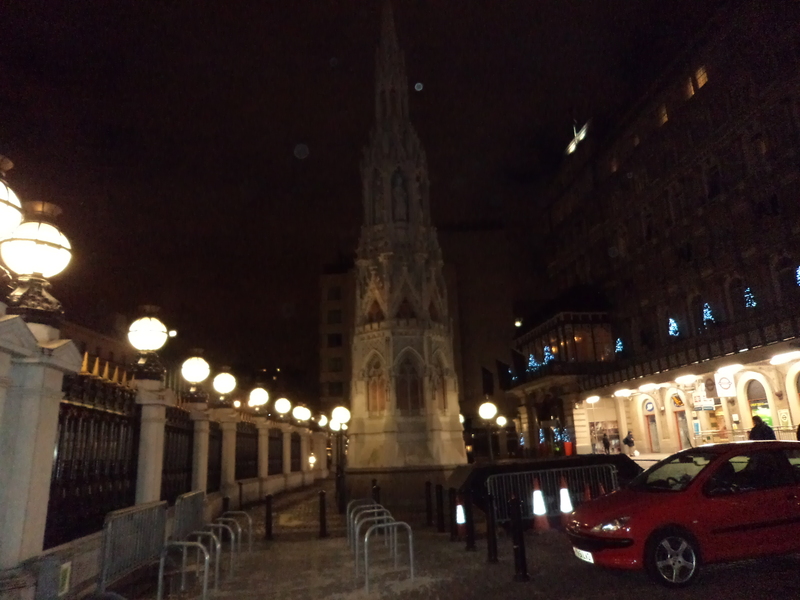 I ended the walk here on December 28th, the eleventh anniversary of Charlotte’s death. 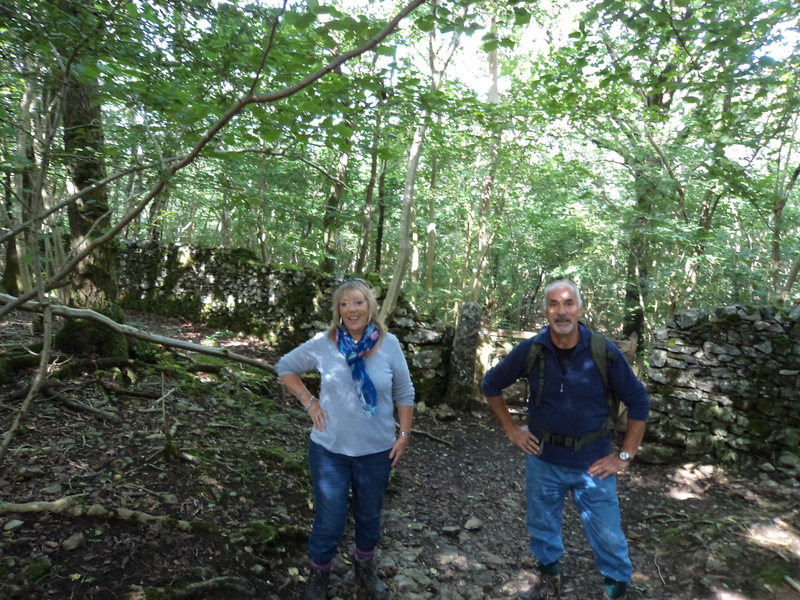 It was the revised date for the completion of this walk but there are still 20.5 miles remaining to complete the second four hundred miles.